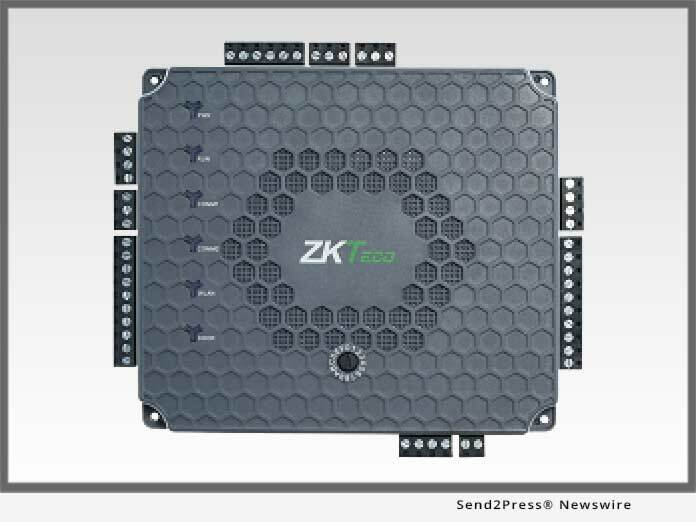 FAIRFIELD, N.J., Feb 20, 2019 (SEND2PRESS NEWSWIRE) -- ZKTeco, a leading provider of biometric, RFID and access control solutions, brings to market its new Atlas Series access control panels. Atlas Series consists of RFID & Biometric door access control panels which have an embedded web application. The web application eliminates the need for access control management software, thus simplifying and greatly reducing installation time, especially for novices who are new to access control. Atlas is available in 1, 2 and 4-door panels and can support up to 84 doors. These panels are powered by POE+ and can also communicate over WiFi. Features include User Enrollment & Management, Door Control & Monitoring, Lockdown, Reporting, Maps, Anti-Passback, First-Card Opening, Multi-Card Opening, Card Design and Duress PINs and more. User-programmable auxiliary relays can be used to control alarms, annunciators, intrusion detection panels, or additional locking devices. Atlas Series panels communicate securely over a TCP/IP network using SSL/TLS. Atlas Series panels communicate with readers via Wiegand or OSDP communication protocol. The firmware is field-upgradeable, allowing your system to stay current with the latest features and security enhancements. A feature rich mobile app for iOS and Android platform gives user the capabilities of managing their access control infrastructure from their mobile devices. "Atlas was designed and engineered in USA to make access control installations fast & simple and at the same time offer all the features required by today's modern facilities," notes Manish Dalal, President & Founder, ZKTeco USA. "While our ZKBioSecurity platform addresses the needs of high-end enterprise installations, presently our customers are looking for simple easy to learn access control solutions. By replacing management software with an embedded web application on the panel and additionally supporting Wi-Fi and PoE, we make it very easy for anyone to learn and install access control systems." ZKTeco is a leading global provider of RFID and biometric and RFID security solutions. Product offerings include Biometric & RFID access control panels & readers, Elevator Controllers, Long-range Readers, Metal Detectors, Turnstiles, Baggage X-Ray scanners and biometric smart door locks. Its solutions are multi-lingual and localized in over 18 different languages. ZKTeco designs specialized products for specific markets and provides local support to all its customers. Its U.S. facility includes a large experience center and warehouse along with local sales and service support. ZKTeco is synonymous with technical innovation, quality, speed-to-market, and reliability.